A new study by Dr. Mansour Mohamadzadeh from Northwestern University shows that a genetically modified version of Lactobacillus acidophilus has promise as a treatment for IBD and colon cancer. Link to a layman’s report of the study. Link to Dr. Mohamadzadeh’s page. Wow, this is neat. Thanks for sharing! I hope this kind of treatment becomes popular soon. regarding my conclussion of the study i posted and the study you mention i would be inclinded to think that the species has an immuomodulatory effect due to its allochthonous nature, and that the effect is due to immunomodulation rather than permanent change in intestinal “bioclimate” or population. There are 17 Lactobacillus species that are associated with the human GIT, some of which were only recently detected by molecular techniques using PCR primers specific for LAB (Table 3). 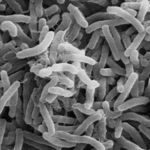 However, the studies cited above show that caution is advised when particular Lactobacillus species are described as real (autochthonous) inhabitants. Species such as L. acidophilus, L. casei, L. paracasei, L. rhamnosus, L. delbrueckii, L. brevis, L. johnsonii, L. plantarum, and L. fermentum have, so far, not been reported to form stable populations in the gut and are likely to be allochthonous. as i understand it, this means they are introduced by food , don´t colonise and have an immunostimulatory (modulatory) effect but not an effect of permanently inhabiting niches , they are not permanent and thereby don´t permanently remove other species!? so i wonder what really happens with the lactobacillus , especially in the upper gut.. they make the SI more acidic which could help.. but if they produce d-lactate ( which i don´t yet know for sure ) then they are problematic and may be a fault in the SCD system due to scientific thinking based on a theory that was formed 50 years ago based on the bulgarian strain theorie ( that lactobacillus are autochthonous inhabitants of the HUMAN gut (this is now largely disproved ) . so do we actually really need any probiotics at all?? this is my question.maybe they are harming people who have sibo, and should simply reduce all bacteria in the SI . so many unanswered questions and just no reliable data, on closer examination its all based on hear say and biased opinion. You are clearly better informed than I on this topic so the only thing I can think of to say is that many people find the scd yoghurt to really help improve their symptoms. I think it’s complex and difficult to study.